Paul Y. Construction, named after its founder Paul Y. Tso, was probably the most successful Shanghainese builder and Chinese-owned construction firm in post-war Hong Kong. Under the management of Paul and his son George, the firm completed many major infrastructure projects in HK and Singapore from the 1950s through to the 1980s such as the Cross Harbor Tunnel and the MTR and although the firm is no longer under family control, the name Paul Y continues to stand for excellence in the Asian construction industry. Starting out as a lawyer, Paul Tso entered the construction business by working for his father in law K.S. Dao at Dao Kwei Kee in Shanghai before starting Paul Y. in 1946. 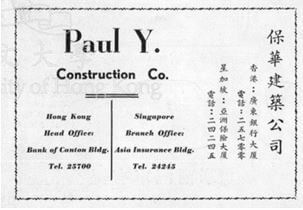 Both firms moved to HK after 1949 where Paul Y Construction continues to build to this day. Paul Yung Tso (車炳榮, 1904-1978) was born on May 16th 1904 into a family closely tied to the construction industry in old Shanghai as his father H.C. Tso (車顯宸) was the owner of a stone manufacturer named Dah Shun (大順石子廠), which supplied many of the leading contractors at the time. He graduated with a law degree from the Methodist sponsored Soochow University, which was regarded as the best law school in China before 1949 and started a practice that specialized in commercial law in Shanghai. One of his clients was Dao Kwei Kee (陶桂記營造廠), a leading Shanghainese construction firm founded by K. S. Dao (陶桂松, 1879-1956) which his father also supplied stones to. Impressed with his English skills, Dao asked Paul to tutor his second daughter Lily (陶君言) in English and eventually the two fell in love and Paul became the son in law of Dao. In 1935, Paul gave up his law practice to work for his father in law at Dao Kwei Kee, in addition to opening the “Paul Y Tso Leasing Office” to dabble in the property business. In 1936, the contract for the new Bank of China building in the Bund was up for grabs and the competition was intense. Paul not only helped DKK secure this important contract but managed to help generate over $500,000 in profits. As the Sino-Japanese War erupted in 1937, the Shanghai construction industry went into recession but Dao Kwei Kee managed to complete two important projects – the Astor Theater in 1939 and Majestic Theater in 1940 under the supervision of Paul. Although Dao was very fond of Paul, his intention was to have his two sons take over his business so in 1946, Paul struck out on his own with a number of DKK staff including A.J. Sze (史濟樵) to start Paul Y Construction Co. Thanks to Paul’s business acumen, Paul Y completed a number of high profile projects in Shanghai including the Lunghwa Airport, Stock Exchange Building, Jewish Club and the Shen Hsin No 3 Mill in Wuxi before moving to HK in 1949. It did not take long for Paul Y to establish itself as a serious player in the HK construction industry. In 1953, Paul Y. opened its Singapore office where in 1956 it completed the 650 meter Merdeka Bridge. Back in Hong Kong it began to take on government projects, including the Central Government Office building in 1955. 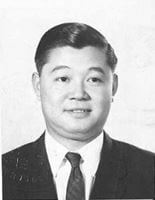 In 1957, Paul Tso became a UK citizen and the first Shanghainese board member of the HK Building Contractors Association. In 1960, Lily Tso bought a large plot of land in Repulse Bay from the toy trader and physician PW Chiu and commissioned Luke Him-sau, who had worked with the family on the Bank of China building in the Bund during the Shanghai days, to design a 14 story residential tower – this became the Repulse Bay Towers which was opened in 1964. In 1962, Paul Y. was hired by Wyncor (the joint venture of Texas tycoons Leo Corrigan and Todd Wynne) to build the 26 story Hong Kong Hilton, one of the largest hotels in the Far East at the time. The following year the firm was involved in the construction of Shek Pik Reservoir, one of the largest in HK at the time. 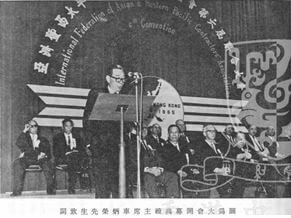 In 1964, Tso was elected vice chairman of the HK BCA and the next year, he served as the president of the 4th International Federation of Asia & Western Pacific Contractors Association (IFAWPCA) Convention held in HK. In 1966, Paul Y. completed the Ocean Terminal in Tsim Sha Tsui for Kowloon Wharf, working in conjunction with UK builder Taylor Woodrow and fellow Shanghainese builder Yao Kee (to be profiled separately). During the 1960s, Paul Tso was also an industrialist as the manufacturer of American cigarettes and Canadian beer locally in Hong Kong. In 1959, he backed his son in law Richard Yung (榮智鑫) and Ng Hon Ping (吳漢平) in forming United Tobacco (美聯煙草有限公司) which obtained the license to manufacture and distribute cigarettes (with brands such as General, York, Kent, Newport and Old Gold) locally from the American tobacco firm Lorillard in 1961, and the firm quickly emerged as the third largest cigarette maker in Hong Kong after BAT and HK Tobacco. In 1964, Lorillard acquired a 50% stake in Union for US$2 million and renamed the firm P. Lorillard Ltd. The following year, a new 9 story factory building on 682-684 Castle Peak Road in Sham Shui Po was built to support the rapid growth. In 1969, Lorillard decided to exit its HK business and the plant’s equipment was shipped to the Philippines and the HK subsidiary was dissolved in 1974. The 50/50 joint venture Tso formed with the Canadian brewery Carling in 1964 to manufacture the beer locally in its plant in 14½ Mile Castle Peak Road only lasted 5 years. In 1969, Paul Y. in conjunction with Costain International of London and Raymond International of New York won the US$45 million contract to construct the Cross Harbor Tunnel, which was the largest single construction contract in HK history up to that point. The tunnel, 6088 square feet long, was completed in 3 years in 1972. During the construction of the Tunnel, Paul Tso listed Paul Y on the local stock exchange in 1970. It also built the Shangri-La Hotel in Singapore which opened in 1971 and completed the Park Lane Hotel in Causeway Bay in 1974. Building on its success in tunnel engineering, Paul Y won the MTR contact in 1975 and over the next 10 years completed 8 stations, 6 tunnels, 3 foundations and 1 depot. At the height of his success in July 1978, Paul Tso died while traveling in Paris at the age of 75 and he was buried in a Buddhist mausoleum in the Cypress Lawn Memorial in California. Paul was succeeded by his son George Chia-chi Tso (車家騏), who was born in July 29, 1931 and who had been involved in the family business since the 1950s after he graduated from MIT with a MSc degree in civil engineering. He married Louise Yung, the sister of his brother in law Richard Yung and granddaughter of the famous textile and flour industrialist Rong Desheng. He served as a director of the Tung Wah Group of Hospitals in 1963. 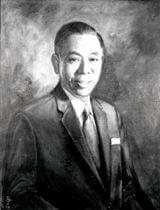 Paul Y. continued to expand under George Tso’s management. In 1981, Paul Y. won the contract to build the new 25 story HK Club Building in Central and also successfully completed the 47 story Raffles Place in Singapore for Singapore Land within 120 weeks. 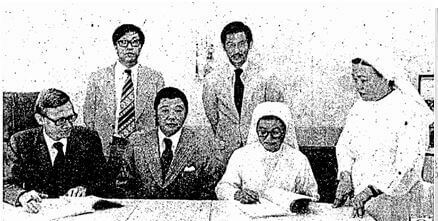 In 1983, George Tso along with H.C. Tang (father of former Chief Secretary Henry Tang) were invited by his wife’s uncle Rong Yiren to join the board of CITIC – the five other directors from HK and Macau were Li Ka-shing, Henry Fok, Ho Yin, Ma Man-kei and K.C. Wong. The next year, the Joint Declaration was signed and Paul Y. participated in the Donjiang Water Supply project. 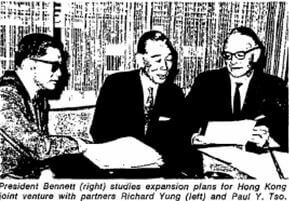 In 1987, Chinese Estates and Hysan Development both bid for Paul Y. and the Tso and Sze families (AJ Sze and his son Mason Sze 史美煊 who was chief engineer of Paul Y.) sold their controlling stakes in the firm to Chinese Estates. In 1991, Chinese Estates sold the construction business of Paul Y. to ITC (the listed shell was privatized the next year), creating Paul Y-ITC one of the largest contractors in the city. In the 1990s, Paul Y-ITC was responsible for the construction of the Mid Levels Escalator, the Center in Central, Ting Kau Bridge and the Cheung Kong Center in 1999, which was built on the site of the Hilton that had also been built by Paul Y 37 years earlier. The firm changed to its present name Paul Y. Engineering in 2005. George Tso passed away on June 15th, 2003 at the age of 71 and was survived by his wife, 2 sons and 1 daughter. His family donated to the renovation of the Bethany and the George C. Tso Memorial Chapel was named in his honor. Lily Tso outlived both her husband and her son and died in 2009 at the age of 99, having witnessed a century of urban development in Shanghai and HK from the front row seat of two leading contractors. Born into a family of farmers in Shanghai, Dao Kwei Kee founder K.S. Dao started out making wooden molds for tile roofing. In 1918, Dao worked on the construction of the original Wing On department store building in Shanghai as a subcontractor for the construction firm of Wei Ching Kee (魏清记). His reliability impressed Wei Ching-tao (魏清濤, 1854-1932), the head of Wei Ching Kee and one of the founding fathers of the modern Shanghai construction industry, who soon awarded him a number of contracts. He founded Dao Kwei Kee in 1920 and his first project was a warehouse for the tycoon Chu Lan-fang (祝蘭舫). In 1923, he completed the Wing On Mill No 1 on Lanzhou Road and impressed with his work, Wing On bosses Paul Gockson and James Goklock gave him the contracts for their own private residences and followed up with the contracts of Wing On Mill No.2 and 3. The contract value of the 3 Wing On mills exceeded 2 million dollars and put Dao Kwei Kee on the map. In 1934, Wing On was building a new building (currently the Seven Heaven Hotel) on Nanking Road, Dao Kwei Kee easily won the contract. Business continued to grow despite the turbulent times with the assistance of Paul Tso in the late 1930s but was finally suspended during the Japanese occupation of Shanghai from 1941 to 1945. When the War was over, K.S. Dao took the lead in re-establishing the Shanghai Contractors Association. When his son in law left to start Paul Y in 1946, his two sons – Samuel YT Dao (陶有德) and M.T. Dao (陶明德) – assumed the leadership of Dao Kwei Kee. 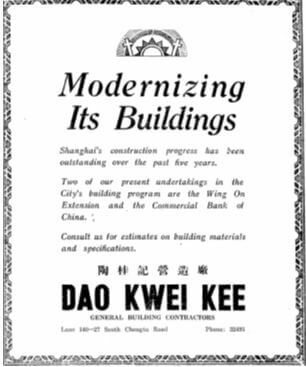 The economic downturn during the Chinese Civil War forced KS Dao to sell some of his properties in Shanghai to keep the construction business afloat. He chose to remain in Shanghai after the Communist takeover in 1949 and died there in 1956 at the age of 77. Samuel and M.T. Dao moved Dao Kwei Kee down to Hong Kong where they built a reputable business, albeit on a smaller scale relative to their brother in law’s operation. M.T. Dao survived the CAT plane crash in Taiwan in February 1968. Some projects undertaken by Dao Kwei Kee in more recent years include the 23 story Plaza 2000 in Causeway Bay which was built in 1982, the Dorsett Regency Kwun Tong in 2012 and One Kowloon Peak developed by Cheuk Nang. This article was first posted on 17th February 2017.